Customize your OleksyPrannyk Apple Watch Band with over 10 colors of thread for a one-of-a-kind look. The Double Tour in Chestnut with turquoise stitching. 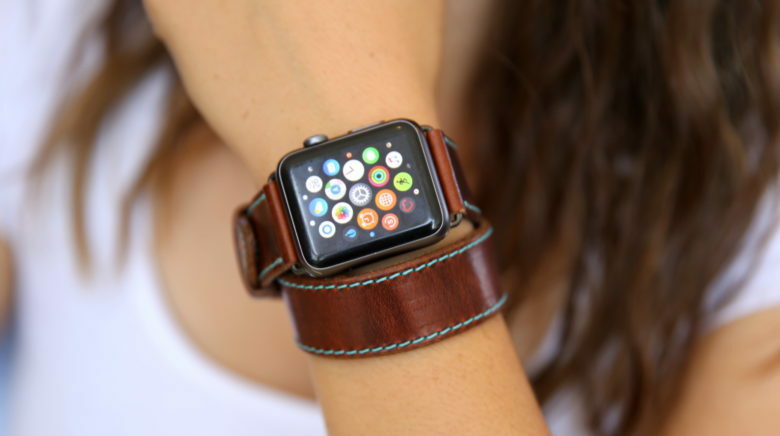 The Double Tour wraps twice around the wrist, offering a totally unique take on the average Apple Watch strap. 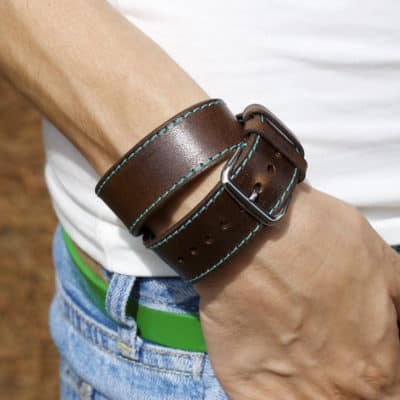 The band is handcrafted from fine, vegetable-tanned Dublin leather sourced from the Horween Leather Company in Chicago, which has been tanning leathers by hand for more than 100 years. Marked by a high oil content, Dublin leather ages beautifully over time and has a beautiful sheen. 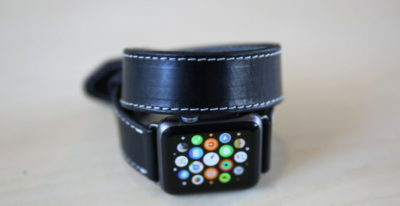 Two pieces of this premium leather are held together with meticulous stitching, which makes the strap pop. OleksynPrannyk is the combined endeavor of Viktor Oleksyn and Pavlo Prannyk, originally from Ukraine. Viktor is the master tailer and has a penchant for creating the perfect, straight seem. He began by crafting a simple pocket wallet — with a straight seam — and sold it the very next day. Selling out at crafts fairs and the like, Viktor found his calling: creating high-quality, handmade leather goods. Every band is carefully designed and handmade for strength and comfort. The demand for OleksynPrannyk products was so high, Viktor and his small, close-knit group moved to the U.S., setting up shop in the historic Mooresville Cotton Mills in South Carolina. 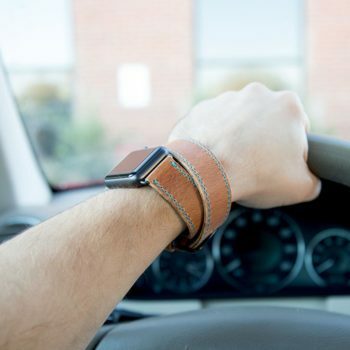 The team of artisans take pride in creating beautiful leather straps for Apple Watch that are completely made to order and customizable for each wearer. Choose from 14 different thread colors: black, navy, light brown, gray, light gray, blue, green, lime green, orange, pink, red, sky blue, turquoise and white smoky to complement your strap choice. Then pick your adapter in aluminum, black, stainless steel, gold or rose gold to best match the fittings of your Apple Watch. The Double Tour Band by OleksynPrannyk also comes in Black, Cream, Brown Nut and Natural, as do its single-tour counterparts. The made-to-order Double Tour in Black. Available in short, regular and long wrist sizes for either the 38 mm or 42 mm Apple Watch. The Double Tour is a gorgeous, modern, fine-leather strap we love and recommend. You won’t be disappointed!